Relish your dreams of building castles and towers of cards with this nerve tickling game, Tower of Cards. When it comes to building castles and towers with cards then any person is sure to forget the world around. In this game you get the opportunity to build your favorite castle. This old card game with its simple game rules will tickle your nerves. This game with its number of irregular determinations makes itself stand as a peer in between similar featuring games. This game is featured with amazing graphics, original sound effects and attractive designs that will be admired by the most experienced players. This player friendly game is enhanced with intuitively simple interface and detailed instructions. This game can be played in full screen or even in the windowed mode. This is a simple game suitable to persons belonging to any age group fit to entertain you for hours together. Eiffel Tower or Pyramid of Heops, anything is possible in Tower of Cards a very interesting game. Is there anyone who didn't build card houses? 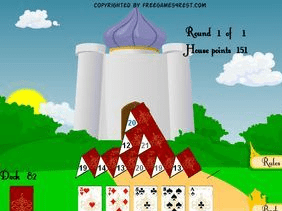 The Tower of Cards game gives an opportunity to tickle nerves while building a Castle. Simple rules, a number of irregular determinations makes this old card game the perfect one in the middle of similar games. Built your own Eiffel Tower or Pyramid of Heops. In the Tower of Cards game everything is possible! Cool graphics, original sounds and design meet the requirements of most experienced players. Stop The Joker, Penguin and other villains from terrorizing Gotham. Break the blocks with this highly imaginative, challenging game!